A Conservation Effort Gone Awry? Wild turkeys are creating havoc in urban neighborhoods all over the country. It’s not that they do anything weird or un-turkey-like. They peck. They scratch. They dig. They climb trees. They poop – chicken manure the size of golf balls! The problem is that, in built up areas they peck and scratch at cars and roofs and outdoor furniture. Dig up vegetable gardens and flower beds. They climb into trees and munch on unripe fruit, drop the uneaten portions to the ground. They poop all over the place. Also, wild turkeys are known to be aggressive towards people at times. For example, when they feel threatened or during mating season. Although such incidents are rare, these huge birds – weighing up to 20 or 30 pounds – can be intimidating as they strut around, usually in a flock of eight or ten. Fearsome. This seemingly untenable situation – wild turkeys and humans coexisting – can be viewed as the legacy of a decision made almost a hundred years ago. In the early years of the twentieth century the wild turkey, a favorite prey of game hunters, was on the verge of extinction. The U.S. Department of Fish and Game [Fish and Wildlife today], recognizing the economic potential in wild turkey hunting, decided to replenish the population of these birds within the United States. Fast forward to the present. There are six million wild turkeys in the United States, and they can be found in every state of the union, save Alaska. And the economic advantages appear to be solid. In California alone, with the twenty-five thousand game hunters in the state, revenue from wild turkey hunting has been estimated at twenty million dollars in a season. This could be touted as the greatest act of conservation of the twentieth century, bringing about recreational and economic boon. Except it appears there was a flaw in the program. When Fish and Game designed the repopulation of the wild turkey, they neglected to look down the road and take into consideration the possibility of disappearing habitat. Fire, logging, urban sprawl, these are some of the events that have contributed to the loss of habitat over the years, a condition that has sent the wild turkey searching for food amongst people. And food they have found. Cat food. Bird seed. Fruits and vegetables. And, commonly, their own bowl of food offered by humans. Despite all the warnings against feeding wild turkeys, that this invites them to take up residency and use the land as they wish, that it would cause them to lose their fear of humans, that if they do not receive their expected meal they could become aggressive, and that the best way to get rid of them is to hold back the food, despite all this information, we continue to feed them. Because we enjoy them and want to keep them close. They are funny. They are audacious. They are beautiful, with their dark, bronze-green iridescent feathers shining in the sun. We are intrigued by the male, puffing himself up, his tail flared out. We feed them because we crave connection to all wildlife. We feed them because contact across species strengthens us and expands our knowledge of who we are as living beings. Because having them nearby helps fill the separation we feel between ourselves and the natural world, and, as Dawn Starin wrote, for many, a flock of wild turkeys openly feeding on a lawn or strutting down a sidewalk offers a glimpse into the unknowable wild. And we feed them because that’s what humans do. POSTSCRIPT: Somewhere along the way you might come across the idea that after the Continental Congress of 1776 Benjamin Franklin, John Adams and Thomas Jefferson were asked to design a seal to represent the new country, and that Benjamin Franklin chose the turkey over the bald eagle. For my part I wish the Bald Eagle had not been chosen the Representative of our County. He is a Bird of bad moral Character. He does not get his Living honestly. You may have seen him perched on some dead Tree near the River, where, too lazy to fish for himself, he watches the Labour of the Fishing Hawk; and when that diligent Bird has at length taken a Fish, and is bearing it to his Nest for the Support of his Mate and young Ones, the Bald Eagle pursues him and take it from him. I am on this account not displeased that the Figure is not known as a Bald Eagle, but looks more like a Turkey. For the Truth the Turkey is in comparison a much more respectable Bird, and withal a true original Native of America….He is besides,……..a Bird of Courage, and would not hesitate to attack a Grenadier of the British Guards who should presume to invade his Farm Yard with a red Coat on. The story began to circulate in the newspapers around America, and the idea that Franklin proposed the turkey in lieu of the eagle has somehow endured. 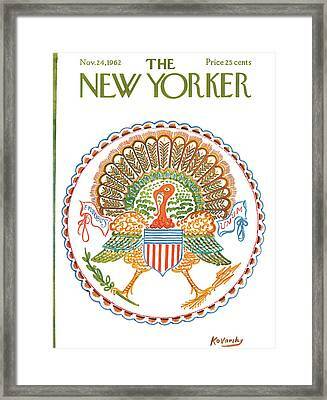 On November 24, 1962, for its Thanksgiving issue, the New Yorker magazine ran a cover photo of a United States seal with a turkey.